Back-Up Story: "History of the Multiverse - Chapter Two"
GOTHAM CITY - Mary Batson stands in fear of Black Adam despite having just been rescued by him. He prepares to attack Mary, assuming she is another of his pursuers, but she assures him finding him was an accident and that maybe she was sent to him for help. She doesn't know where Billy (Captain Marvel) is and felt it was he who called her to Gotham. She feels they're the same, alone and scared, but at least his powers make him strong. He laughs. METROPOLIS - Jimmy Olsen is grilled by both Perry White and Lois Lane about the events in Arkham Asylum when the city suddenly comes under siege from energy blasts from a clouded sky. Jimmy gets down to street level and uses his signal watch to summon Superman before starting to shoot some photos. Then a stray bolt destroys a skyscraper's gargoyle, and a small family is under the path of the falling debris. Jimmy contemplates what to do. SAN FRANCISCO - Donny Troy lays a wreath on the grave of Duela Dent aka The Joker's Daughter during her small service, attended by Cyborg, Robin, and Raven. All depart except for Donna. She's approached by Jason Todd, who shares his suspicions that he, Duela, and Donna share a connection, in that they were either dead and reborn, or were from parallel earths and don't really belong here. He admits he wanted to be around people living on borrowed time. JLA SATELLITE - Starman keeps watch over Karate Kid, currently incarcerated for assaulting Batman in the Batcave due to a Starro on his neck. He remarks how he wishes his Legion partners Brainiac 5 and Lars were here so they could figure it out. Starman tells him that Doctor Impossible is responsible but as to why that's still a mystery. Back in Gotham, Black Adam stops laughing and explains that he considers his powers a curse because of what they've cost him. Mary disagrees, calling them a gift. Adam senses what Mary wants is on the same par as her attackers asking for death by coming there. At surprisingly-superhuman speed, Jimmy gets the family out of the way of the falling debris. He can't explain it, nor does he have time, as a larger projectile crashes into the ground. When the smoke clears, the projectile is revealed to be Lightray of the New Gods. Superman arrives on the scene and examines him; his only deduction is that what could have done this to a god is not something to be taken lightly. He soars upward to investigate the source of the danger while Jimmy stays with Lightray. He abruptly grabs Jimmy's wrist and starts to glow brighter and brighter while repeating the word "Infinite." In the stratosphere meanwhile, Superman's microscopic�vision�detects the faint image of a person just before�it�vanishes. He suspects it to be a Boom Tube as he streaks back towards Metropolis. He sees the�blinding glow�from the crater where he left both Lightray and Jimmy and�is shocked to see Jimmy walk�out and announce Lightray is dead. Superman contemplates what it means to the universe when a god dies. The two monitors continue their discussion of the beginning of the�Multiverse, focusing on the initial�encounter of the Barry Allen Flash and the Jay Garrick Flash when Barry crossed from Earth One to Earth Two. The pair teamed up to take on Vandal Savage, who had imprisoned the Justice Society of America.�Their company acknowledged that both universes would have found out about each other eventually, as was the inevitable meeting of the JSA and the Justice League of America when the enemies of both worlds combined forces. They traded universes to throw their adversaries off balance, and their commitment to justice was proven strong by this alliance. Seven Earth-Two heroes teamed with nine Earth-Ones to stop another threat�to both worlds. However,�the momentousness of this effort cannot be underestimated, for it was preparation for�future situations, which would�result in the death of one hero and greater menaces. The brother monitors�remark that soon the heroes of both worlds would realize their responsibility would extend beyond two universes. Main Story - 4: Before I ask the question, I want to say that this is a perfect complimentary piece to 52 and�I consider it a privilege to come back and work on the reviews for what is definitely going to be the precursor to the biggest event in DC history. Now on to the question at hand: WHAT THE HECK IS GOING ON WITH JIMMY OLSEN?! In Arkham Asylum, he does a�Plastic Man impression before getting sliced up by Killer Croc? When the creators announced that Jimmy would be the eyes and ears of the readers for this series I thought that it'd be something on the level of Marvel Comics' Ben Urich in CIVIL WAR FRONTLINE. The fact that he's got superhuman powers kind of separates him from us. As for Jason Todd and Black Adam, it's hard to make heads or tails of where they stand in the grand scheme of things. And it's easy to guess where Black Adam's going with the prospect of Mary wishing for power. For that matter, how did Adam get his powers back? Didn't Captain Marvel strip him of his powers by changing his magic word? I think there's�a series coming out that explains it; I hate it when the chronology gets screwed up like this. And is Mary really that desperate to wish for the powers of Black Adam, knowing how they corrupted him? I fail to see why Billy would forget about his sister like this. I know he's busy with helping Freddie take his place in TRIALS OF SHAZAM but c'mon man put family first. I see the Jason-Donna existentialist story reminiscent of the Question-Montoya journey in 52. It'll be interesting to see if a relationship comes out of this. Oh, and FINALLY we get to see Superman in this book; here I thought it'd be the same situation as in the previous series. However, I see that his role has been downgraded to cameo in favor of Jimmy's story. Interesting switch; Superman's pal is at the forefront while Big Blue is playing catch-up. The Karate Kid story picking up from the Lightning Saga story in JSA and JLA, thus cementing it in current continuity, just as the death of Duela Dent does. So far it's a great start to a good series; having Paul Dini at the helm is a brilliant move. I am in awe of him and his work on the various DC animated series, especially Superman and Batman Beyond. I can't wait to see what he delivers for this book, especially in the case of the New Gods angle in the coming crisis. What does it mean when something as tragic as the demise of a divine being occurs in the grander scheme of things? And how is Darkseid involved? Was that really a boom tube? And just like the talking Red Tornado head in 52, we have a key word repeated by Lightray. What is the significance of "Infinite?" These questions have no problem keeping the readers salivating at what will happen next. Keep it up, Paul. Main Art - 5: David Lopez is the man in this issue. His meteor shower above Metropolis reminded me a lot of Armageddon, which was perfect to capture the catastrophic nature of the situation. His designs of Superman and Jimmy were great, as was his awesome depiction of Donna and Mary. However, I notice a difference in the funeral scene; I don't remember Jason�without his red domino mask in the Teen Titans issue.�The sequence with Superman could have been better, however. It seemed too silver age with the use of his microscopic vision. Other than that good stuff, Dave! Back-up Art - 5: You saw that one coming, right? If you didn't then were have you been? C'mon one of the biggest artists delivering his take on classic moments from the silver age? You can't get bigger than that people.�It's obvious he tried to maintain a balance between his own style and the original designs of these characters at the time of these events' publications, such as the shot of the JSA and JLA encountering each other for the first time. Overall great stuff Dan. Can't wait to see more from you in the coming weeks. 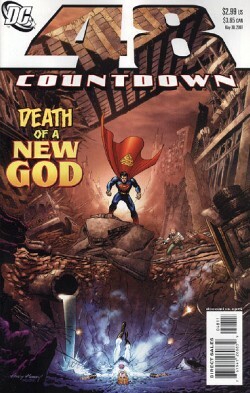 Cover Art - 5: Andy Kubert delivers what the previous series did not: an image centering on the main event of the issue, albeit a spoiler for readers. The shot of Superman in the background while Jimmy checks on Lightray gives the reader the notion that the Man of Steel was too late to save Lightray from whatever caused his downfall. I love his work on the Bat-books, and he doesn't fail to impress in this issue. Stay on, Andy, 'cause we need ya pal.